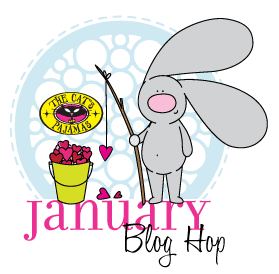 bugbites...: The Cat's Pajamas New Release! FREEBIE! The Cat's Pajamas New Release! FREEBIE! Hey there TCP Fans! I'm joining my fellow Cats as we hop, hop, hop along and release a new bundle of stamps, dies and sparkly bits today! 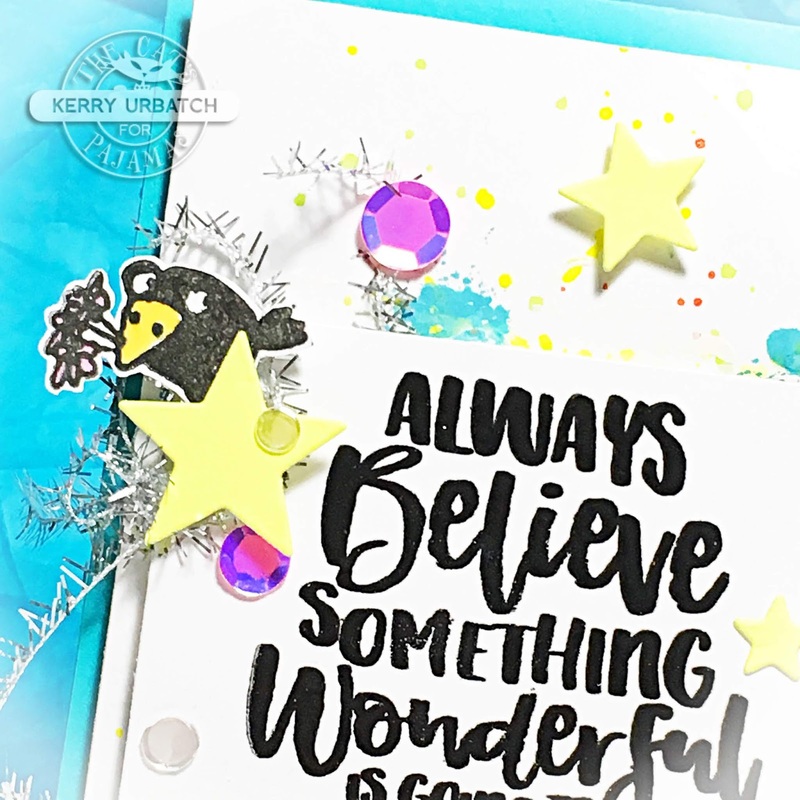 Today IS the day and we hope you've enjoyed the week long sneaky-peek of all the newest stamps and dies officially released today! Did you know you can purchase the Poochie Pack or Kitty Kat Pack today for an additional 10% discount? YEPPERS! So get shopping! PS...Did you know that there's a FREEBIE stamp in every release too? Today, I'm sharing a project with the freebie set for this release: Always Believe! 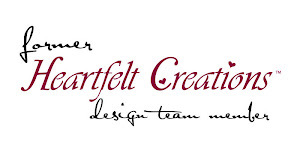 How do you earn a FREEBIE Set? Well, just place your order of $65 or more (after discounts and shipping applied) and receive this set FREE! Here's a direct link to all the goodies: What's MEW! 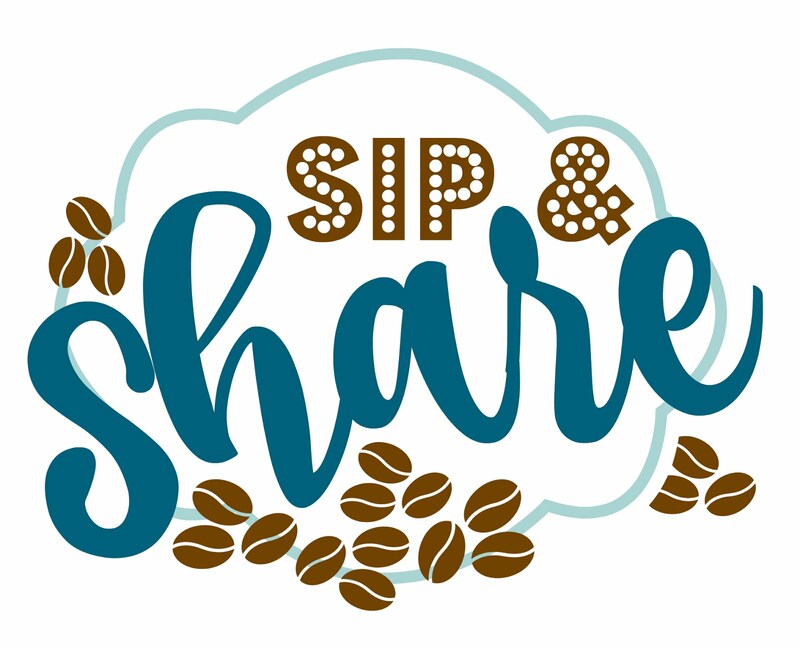 No worries if you can't make a Freebie Set purchase this month. You can always purchase THIS set if you wish! Need a little SUNSHINE....a little HAPPY? How about some SNOW? Well, all you've gotta do is BELIEVE! 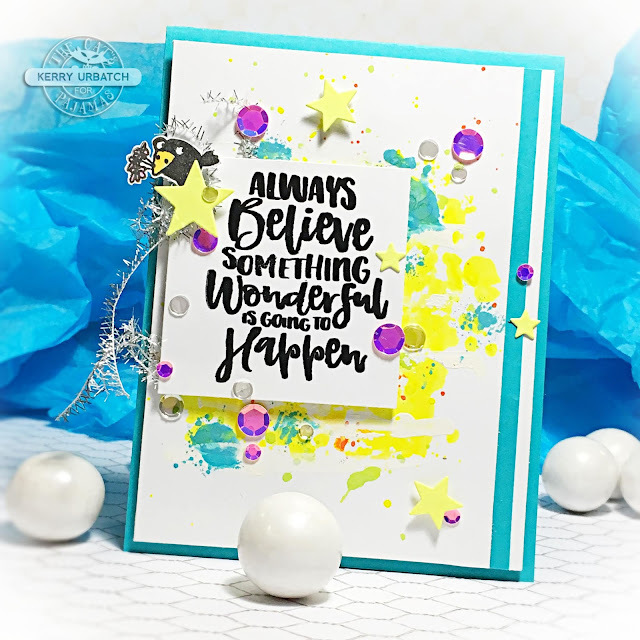 :) I created this bright and happy card featuring Always Believe using some neon inks and distress oxides. I stamped the sentiment in Versafine Onyx black and embossed with clear EP to give it some shine. To create the background, I just brushed some neon yellow ink onto my non-stick mat and lifted the color onto my paper. I then splattered some neon green and orange ink onto the paper and added some splats of Distress Oxide blue. Pretty WILD right? I LOVE it! This is super fun, Kerry! I love the little crow and the happy colors! Snow and 3 degrees here! Thanks Judy. I loved that little crow and thought he was just the perfect little dude to add to this card. We got an early release today, rain, about an inch of snow and tomorrow is a SNOW DAY! It's about 35 degrees. What a wonderful sentiment and such a bright, colorful card! 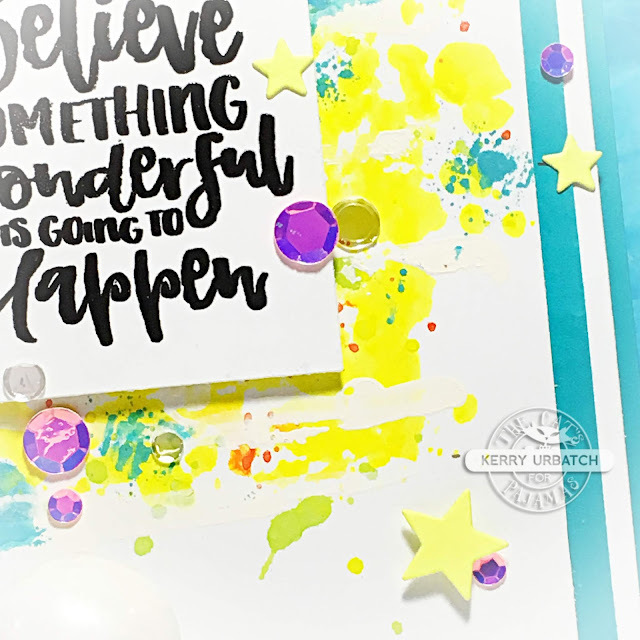 Love the bright colors on your card - such a great design and I love that sentiment! Beautiful & bright! Love the splatter background on this! Such great composition and fun colour on this one Kerry!